In the first step, we want to automatically assign addresses in a wired network. 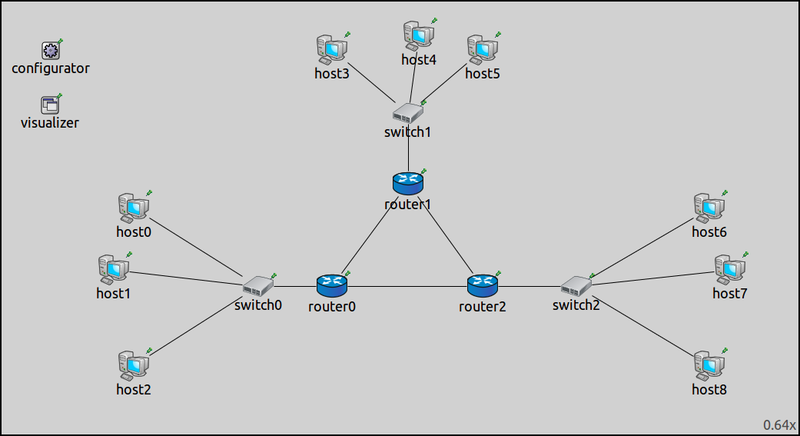 To make the task a little bit more complicated, the network won’t be a single LAN but several LANs connected via routers. We want to place nodes on each subnet into a different subnet, but otherwise we don’t care how addresses are assigned. We also ignore the question of filling routing tables for now – it will be covered in later steps. The network contains three routers, each connected to the other two. There are three subnetworks with StandardHosts, connected to the routers by Ethernet switches. It also contains an instance of Ipv4NetworkConfigurator. description = "Fully automatic IP address assignment"
assignAddresses = default(true) controls whether the configurator should perform auto address assignment, i.e. assign IP addresses to interfaces. Details can be specified in the XML configuration. It tells the configurator to assign IP addresses to all interfaces of all hosts, from the address range 10.0.0.0 - 10.255.255.255 and netmask range 255.0.0.0 - 255.255.255.255. The configurator has several boolean parameters named dump..., which cause it to dump certain parts of the configuration information into the module log. The one that corresponds to assigned IP addresses is called dumpAddresses. These parameters are false by default, but we set them to true in the General section of omnetpp.ini to facilitate experimenting with the configurator. Network interface information, such as interface names and IP addresses, can be visualized using the InterfaceTableCanvasVisualizer module, which is already included in the network as a submodule of IntegratedCanvasVisualizer. We also turn on interface visualization, but tell the visualizer to ignore switches and access points, as they don’t have IP addresses. Other settings in the General section, such as the WiFi bit rate, are not relevant for the topic of the tutorial. 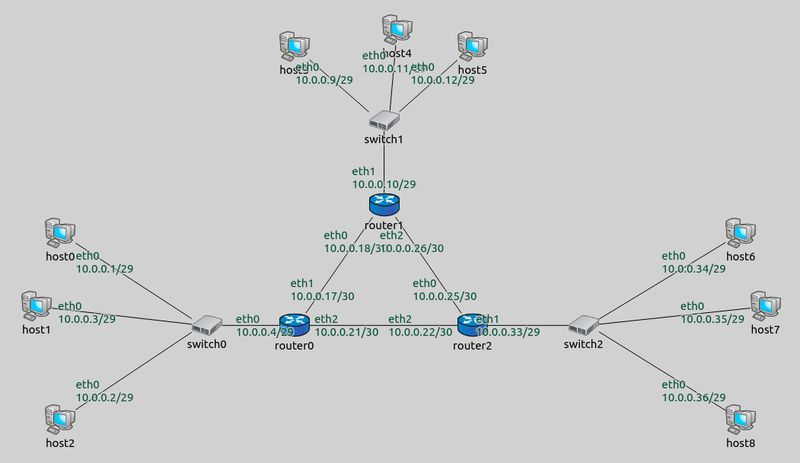 *.visualizer.interfaceTableVisualizer.nodeFilter = "not (*switch* or *Switch* or *AP*)"
The IP addresses assigned to interfaces by the configurator are shown on the image below. The switches and hosts connected to the individual routers are considered to be on the same link. Note that the configurator assigned addresses sequentially starting from 10.0.0.1, while making sure that different subnets got different address prefixes and netmasks, as instructed by the assignDisjunctSubnetAddresses parameter.